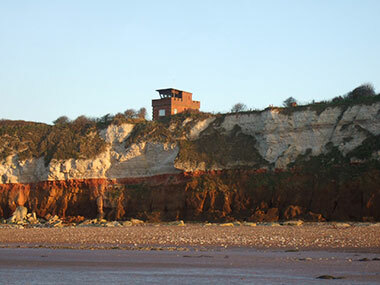 The Coastguard Lookout is a historic property located along the Old Hunstanton Clifftops in Norfolk. Originally built as a Marconi Wireless Station back in 1906, the Coastguard Lookout played an important part in both World Wars, intercepting German radio transmissions and tracing German fleet. In 1976 it became a maritime museum which eventually closed and several years later the property was restored by new owners. The property features a top floor lookout, which gives unrivalled panoramic views of the Wash; perfect for watching birds, boats, the ever-changing tide and for catching beautiful sunsets. Norfolk has a stunning range of bird life and beautiful nature reserves where it can be discovered all year round. Old Hunstanton is only a short walk away from the property where you'll find a shop, a delicatessen, a post office and several pubs and restaurants. The cliffs and beach are just a 5 minute stroll away!